The scanner is excellent. The driver in the box didn't instal the driver software for Win7 64 but software did. I downloaded the latest driver from Xerox site and it all works perfectly. The combination of this scanner and the supplied Software is an ideal tool for business that want to scan volumes of data rather than keep paper. There is super power packed in this small scanner. Capable of scanning a variety of documents, including long, small, thick and thin sheets, the DocuMate® 5445/5460 will greatly boost the efficiency of your office. Conveniently small enough to fit on the reception desk of a medical office or bank, the scanner is designed to quickly scan customer or patient ID cards and other documents, enabling real-time information sharing to provide fast, accurate customer service. The scanners have a convenient interface that allows the user to simply insert their document and press one button on the front panel to initiate scanning and automatically email, print, convert or share their document. Visioneer® OneTouch® provides scanning presets at the optimal resolution, color depth, file format and paper size for common scanning tasks, which can also be easily changed at any time. 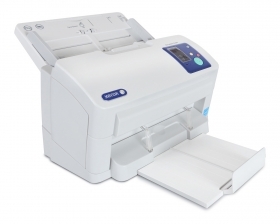 The DocuMate 5445/5460 can quickly convert a large number of documents into electronic data, so it provides smooth usage even in offices with many users. Scanning documents into data makes it possible to consolidate information, which improves productivity. And it lowers the cost of handling documents and reduces the space needed to store them. Another unique feature of the DocuMate 5445/5460 are the paper feed rollers. The rollers rotate independently left and right to reduce document skewing during scanning. In addition, the active double-feed prevention roller reverses rotation the instant that the leading document leaves the paper feed section to prevent the double-feeding of documents that are simply stuck together. However, there are documents for which scanning should not be stopped even when double-feeding is detected. Those include envelopes and documents with sticky notes attached. When the DocuMate 5445/5460 pauses at one of these documents, scanning is easily resumed with the touch of a button.